Eugène Boudin at the National Gallery of Art celebrates the centenary of Paul Mellon's birth with an exhibition of one of his favorite French artists. Mellon's substantial gift of paintings, watercolors, and drawings by Eugène Boudin (1824 – 1898), supplemented by works given to the Gallery by his sister Ailsa Mellon Bruce and other benefactors, provides a nearly comprehensive picture of the artist. While Boudin was clearly interested in depicting the realities of his era, his great theme was the fleeting play of light on water and clouds. 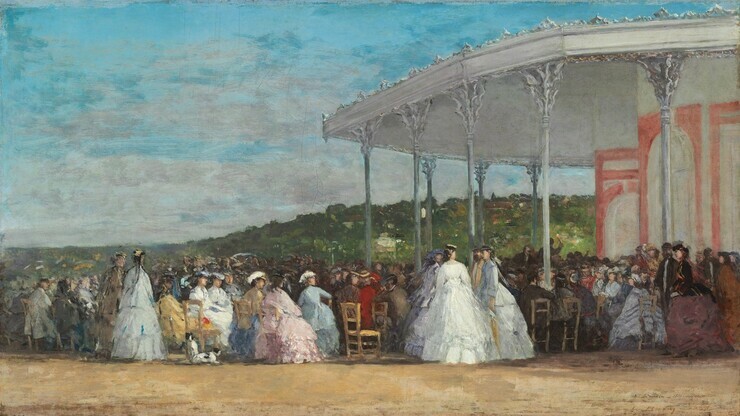 His ability to capture momentary sensation in works of timeless beauty made Boudin a natural addition to the collection of Paul Mellon, who wrote: "It seems to me that art makes one feel the essence of something, turning the ordinary, everyday object or scene into a universal one. Like poetry for Wordsworth, it is 'emotion recollected in tranquility.'" During his long life, collector Paul Mellon (1907 – 1999) donated more than one thousand works of art to the National Gallery. He also supported the Virginia Museum of Fine Arts, among other art museums, and founded the Yale Center for British Art in New Haven, Connecticut. His tremendous generosity was matched by both his refined taste and passion for collecting. Eugène Boudin was born in Normandy in 1824 and died there in 1898. 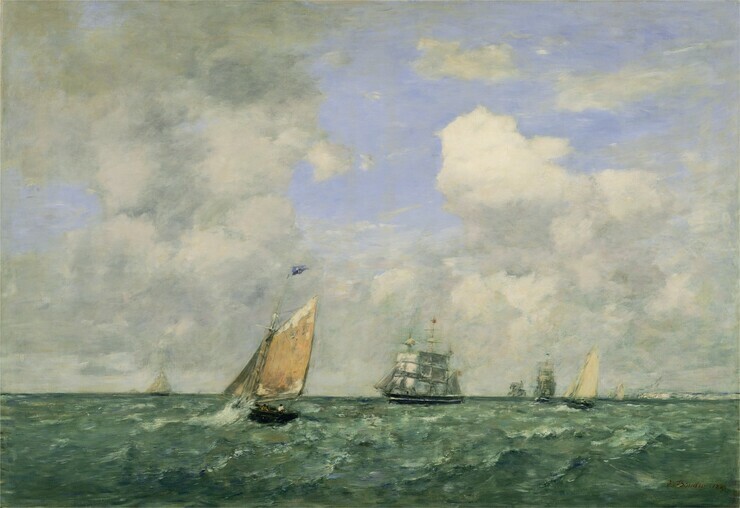 His father was a sailor on one of the first steamships that ran between Le Havre and Honfleur, and Boudin worked as cabin boy on his father's ship, observing from an early age the ever-changing sea and sky that would become his primary focus as a painter. In 1836, at age twelve, he began to work in a stationery and frame shop. The owner gave him a box of paints, but little else is known about Boudin's early interest in art. At twenty he co-owned a business, framing and selling the works of visiting artists. In 1847 he sold his half of the shop to pay his way out of military service. Sponsored by his former artist-clients, Boudin went to Paris to study and copy in the Louvre. In 1851 the town of Le Havre awarded him a three-year scholarship. 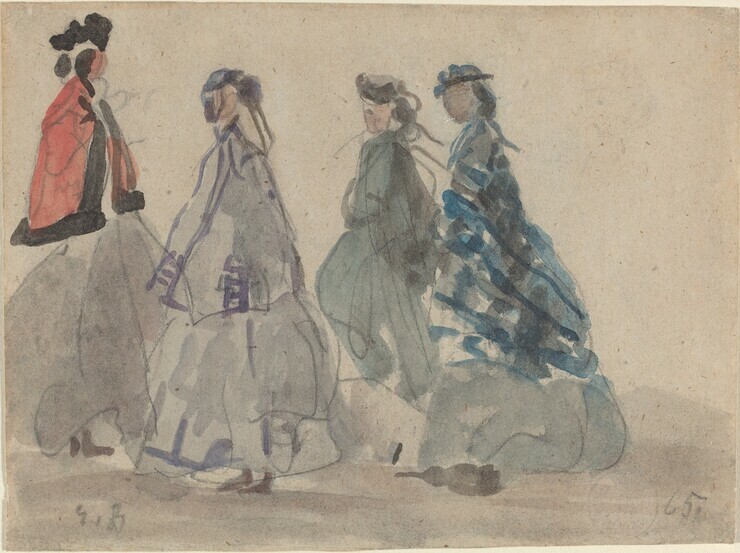 Boudin quickly established the pattern he would follow throughout his career: in summer he traveled to paint outdoor sketches that he would complete in his Paris studio over the winter. He stayed along the Channel coast, mostly in Normandy and Brittany. Though he painted inland landscapes, peasant scenes, and still lifes, it was the seaside, especially its river estuaries and harbors, that most attracted Boudin's eye. 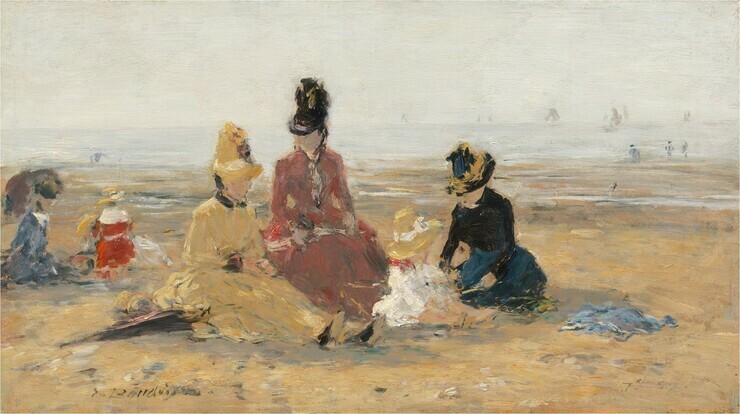 In 1862 he started painting the droves of fashionable tourists who vacationed at Normandy beach resorts. These pictures—his best known—were highly marketable and number in the thousands. In the 1860s Boudin did not yet consider his outdoor studies fully finished; he felt they should be "poussé" (elaborated), as he said, to completion using notes, sketches, and memory. He meticulously recorded details about atmosphere, weather, and times of day (and inscribed this information on his sketches). He wrote to a student: "An impression is gained in an instant, but it then has to be condensed following the rules of art or rather your own feeling and that is the most difficult thing—to finish a painting without spoiling anything." At the same time, Boudin also claimed "everything that is painted directly and on the spot has always a strength, a power, a vivacity of touch which one cannot recover in the studio." Eventually Boudin would paint almost entirely en plein air, saying that one brushstroke placed outdoors was of more value than two days spent in the studio. His work foreshadowed impressionist concerns with atmosphere and the changing effects of weather and light. Corot called him "the king of the skies." The direct freshness of his works was a particular influence for Monet, who as a teenager worked alongside Boudin. As the modest Boudin himself wrote: "I may well have had some small measure of influence on the movement that led painters to study actual daylight and express the changing aspects of the sky with the utmost sincerity." 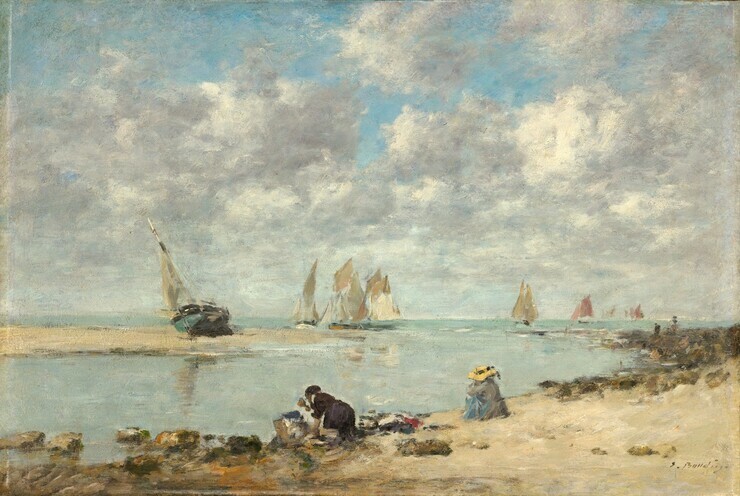 While many of Boudin's paintings depict fashionable vacationers on the beach or promenade, several present the daily activities of the local inhabitants who made such leisurely pursuits possible. 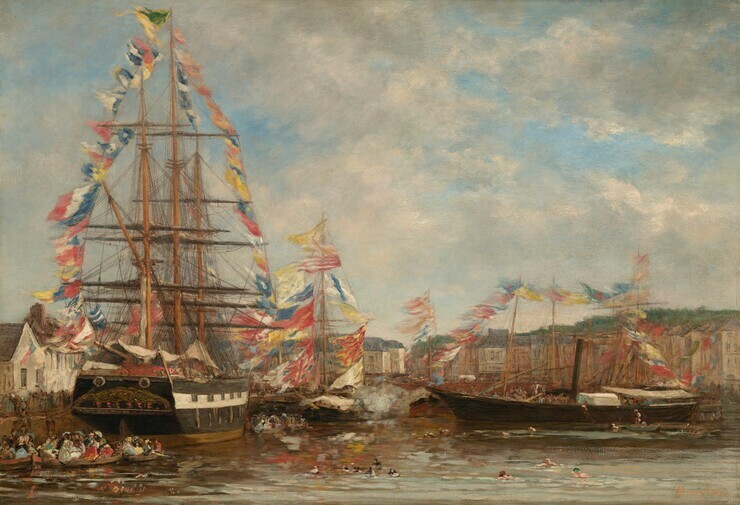 Scenes of ships at sea and harbor festivals, as well as washerwomen, fishermen, and sailors at work, all remind the viewer that the English Channel was the economic and social lifeblood of these communities long before the rise of tourism. Throughout his career, Boudin alternated his time between the seaside and Paris. During the warm summer months, he found inspiration at the shore, initially making meticulously rendered pencil drawings, such as those depicting coastal and farmyard scenes. He soon began to make quickly brushed watercolors of beachside visitors that would have been especially appealing (and affordable) mementos for the tourists depicted in them. In his Paris studio in the winter, Boudin developed his sketches into finished pictures and cultivated a cosmopolitan audience with such large compositions as Entrance to the Harbor, Le Havre, which was exhibited at the Paris Salon in 1883. Unlike the watercolors, these paintings served a more public function, helping the artist gain official recognition. Before about 1750 Europeans were not much interested in the seaside as a place to be—oceans were considered dangerous necessities of commerce and transportation, fishing and war. It was in England that large numbers of people first began to enjoy the beach. So perhaps it is not surprising, given England and Normandy's shared history and proximity, that Normandy welcomed early beach goers in France, and that they were mostly a mix of French and English tourists. As railroads made access easier, a developed tourist infrastructure arose, often backed by English money. Views painted by artists "advertised" Normandy's attractions, and tourists’ enjoyment of local sites, in turn, increased demand for landscape painting. 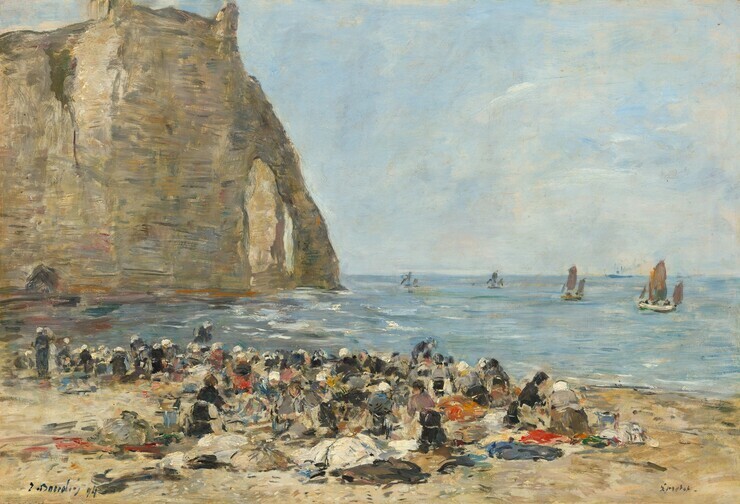 During Boudin’s lifetime the Channel coast was transformed by tourism. Already in the 1830s some small fishing villages accommodated visitors from France and England. Artists sought the opportunity to paint scenic locales and peasant life, and were soon followed by others in search of the healthful benefits of sea water and air. Bathers, in voluminous clothes to protect against the sun as much as immodesty, did not so much swim as immerse themselves in the water. Ladies were carried out in divans. Actual swimming did not catch on until mid-century or later, when other more competitive activities like rowing and boating also became popular. "A bathing station not far from Fécamp, much frequented by artists and literary men, having risen into notice through the writings of Alfonse Karr. It is now one of the most fashionable watering-places on the northern coast of France, situated at the foot of interesting cliffs, with an open beach protected by an embankment. The casino is built on a wide terrace, with the bathing establishment on the right. The theatre, concert-room, ballroom, and restaurant of the casino afford amusement for the visitors, entrance fees being on a moderate scale. Beyond the cliff of Amont are the baths of the Roches Blanches, which, being difficult of access by a tunnel and an iron ladder, are only available for men." "Situated at the mouth of the Seine, and at the terminus of the direct line from Paris. Population, 122,291. A modern, very busy town, one of the most prosperous ports in France; has no historical monuments and few public buildings of interest. The principal street is the Rue de Paris, which leads from the Grand Quai at one end to the Hotel de Ville at the other, passing through the centre of the Place de la Maure, formerly Place Louis XVI., out of compliment to the sovereign whose legislation laid the foundation of the prosperity of the town. Havre has been greatly enlarged during the present century. The outline of the old town is marked by fine boulevards, which, commencing at the Grand Quai, follow the original lines of the fortification that formerly divided it from the suburbs of Ingouville, Sanvic, and Gravelle. These have become a portion of the town by the removal of the fortifications in 1856. Havre was but a small village up to the time when Francis I. caused the harbour to be dug, and granted charters to the inhabitants, which speedily developed its commercial resources. It was connected with the history of England during several centuries. Henry VII. of England embarked here in 1485 for Bosworth, and in the reign of Queen Elizabeth the town was delivered to England, but lost within a year. In 1694 Havre was bombarded by an English fleet, and in 1796 Sir Sidney Smith ran his vessel aground in the harbour, and was taken prisoner. The harbour consists of an Avant Port, dry at low water, and nine floating docks, with large dry dock. The Basin de l'Eure, communicating with the storehouses, receives the Atlantic steamers. Passengers from Southampton are landed at the Grand Quai, near the Customs. The mouth of the Seine continually becomes silted with sand washed up by the tide, notwithstanding constant dredging. The sea beach is of shingle, and much frequented in the summer. Bathing is dangerous in rough weather, as the tide runs very strong. The town is well supplied with amusements, such as theatres, casinos, concerts, baths excursions, [and] restaurants." "A small port on the west bank at the mouth of the Seine, facing Havre. Population, 10,000. Seen from a distance the town is picturesque, but it does not improve on acquaintance, the streets being narrow and crooked. It contains, however, curious ancient houses. Honfleur was several times held by England, but finally abandoned in 1449, and was a prosperous port up to the time of Louis XVI., when the development of Havre reduced it to a fifth-rate port. [Attractions include] St. Catherine, built of wood; badly restored in 1830. St. Leonard, 17th and 18th centuries; fine modern glass. St. Etienne (nave of 15th century, choir of 16th century), used as a storehouse....The Hotel de Ville [city hall] contains a small museum....An agreeable promenade may be taken to the Cote de Grace, to the west of the harbour; a pilgrimage chapel, much restored to by sailors, from which one of the finest views in Normandy is obtained....The sea baths are only patronised by the townspeople." "One of the most popular of all the modern French watering-places. During the season it accommodates at least 20,000 visitors at a time, and as many as 120,000 visitors in a season. The town has no historical attractions, being entirely modern, but contains numerous handsome private villas. The Casino is open from July 1st to September 1st, and is thronged by all the fashion of Paris; in the season three toilets per day are de rigueur for ladies. The beach is of sand, and the small bathing sheds are drawn down to the edge of the sea. Admission to casino, 2f. to 3f. per day, according to the month, August to September being the height of the season. Concerts are given daily, theatrical performances twice a week, and a ball on Sundays. By the Promenade Pier is a small casino and club called the Eden, where concerts take place on the terrace; admission from 1f." "A fashionable bathing station on the coast, on the west bank of the Touques, facing Trouville...was brought to notice by Sir Joseph Olliffe, late physician to the English Embassy at Paris. Attractions include a casino and bathing machines, hippodrome and racecourse, jockey club and lawn-tennis club....The new town contains numerous villas surrounded by luxuriant gardens. Concerts are held daily in the open air and in the casino, where every possible attraction for visitors is provided. Splendid hotels and handsome shops complete the requirements of this first-class seaside resort....Many of the French aristocracy have villas here. The bathing is similar in character to that of Trouville, its rival." Boudin played a critical role in promoting plein-air (outdoor) painting in France: in addition to his own artistic contributions, he was the first to introduce the young Claude Monet (1840 – 1926) to the pleasures and challenges of painting directly from nature. As Monet would much later comment, "If I have become a painter, I owe it to Eugène Boudin." Their friendship was long and fruitful; Monet even invited his mentor to participate in the first impressionist exhibition of 1874. Like the impressionists, Boudin had a keen interest in depicting the changing character of contemporary life and used lively brushwork to animate his scenes. 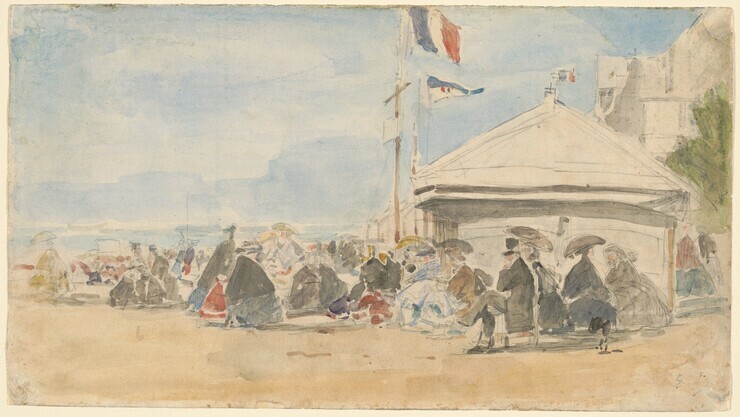 He likewise shared the impressionists' concern with light and atmospheric effects, which is evident in the sea breezes that seem to blow through many of his pictures, snapping flags and ruffling skirts and parasols. Boudin's mastery at conveying the nuances of midday sunshine, brilliant sunsets, and menacing storm clouds led Camille Corot (1796 – 1875) to praise him as "the king of the skies." Open-air painting was already an established tradition by the early nineteenth century. An influential treatise published in 1800 by Pierre-Henri de Valenciennes stressed the value of outdoor studies done quickly and with a broad sweep: "all études (studies) from Nature should be done within two hours at the outside, and if your effect is sunrise or a sunset, you should take no more than half an hour." Studies were a vital part of a young painter's training and continued to play an important role in his or her preparation. Many artists made regular expeditions to paint in scenic locations, sharpening their eyes and recording effects that could be employed in later compositions; however, at midcentury neither artists nor audiences—and certainly not the official art establishment—afforded these plein-air sketches equal standing with a finished work painted in the studio. 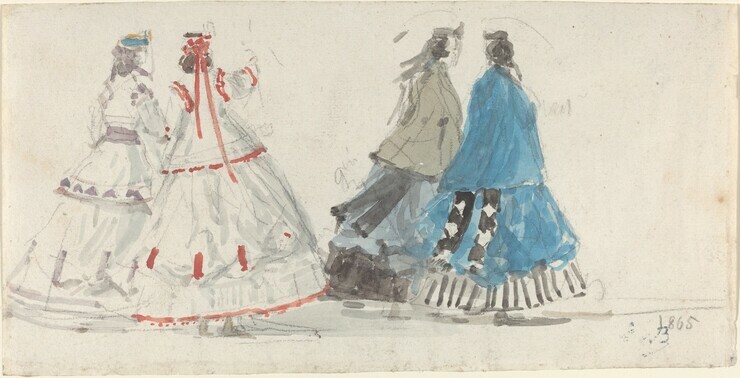 Although sketches were exhibited at the Salon, they were always identified as studies. Several factors helped erode this distinction. In 1841 an American artist invented collapsible metal tubes for oil paints, which made working outdoors much easier (previously, pig bladders were used to store pigments). Eventually, artist suppliers offered portable paint boxes (boîtes de campagne), some with built-in easels and parasols. These innovations coincided with the expansion of railways, which made it much easier to reach the countryside in the first place. The sheer number of people painting outdoors increased. Artists' colonies grew up in picturesque locales, and many of them would become tourist destinations. By the mid-1800s a new mindset was also at work. Realism, in art and literature, emphasized "truth" and "sincerity" rather than contrived constructions, prompting progressive artists to paint nature with unembellished directness. These bolder painting styles also started to blur the difference between sketches and fully realized studio works. 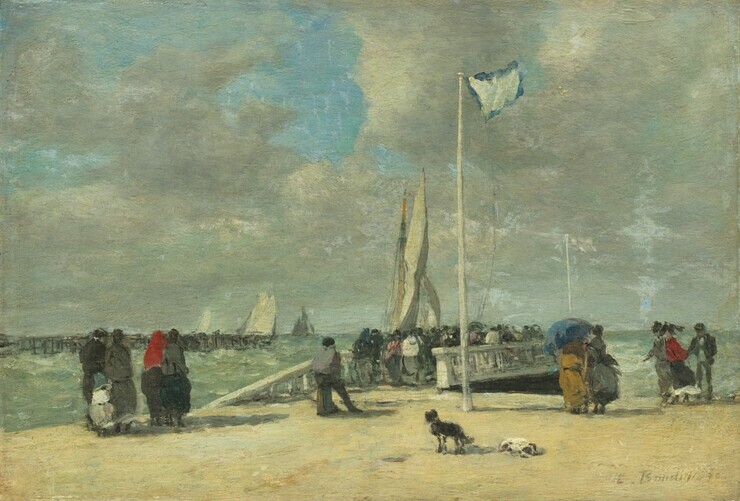 Boudin's understanding of light and weather effects depended on plein-air studies, and he began to paint finished works almost entirely outdoors. In 1864 Charles-François Daubigny exhibited as a Salon picture a landscape created entirely on the spot. By the 1870s plein-air painting had become a touchstone for impressionists, who placed a premium on direct observation, speed, and spontaneity as they tried to capture the look of changing weather, seasons, and times of day. This on-the-spot study, although not specifically made for Jetty and Wharf in the previous slide (in fact, painted years later), nonetheless illustrates the relation between an oil sketch and a studio-finished picture meant for exhibition at the Salon. 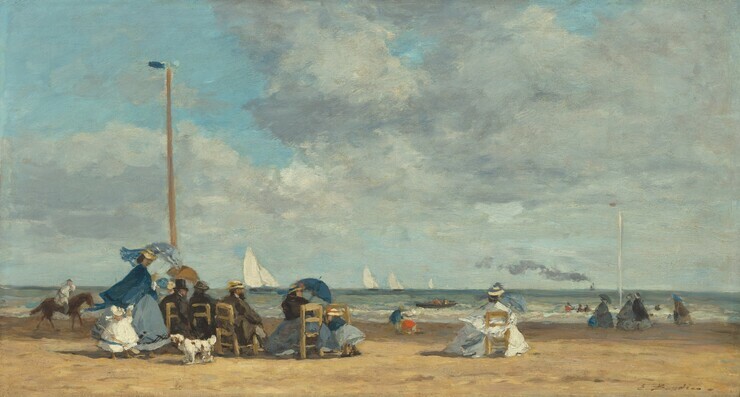 Eugène Boudin began to paint tourist scenes in 1862; the next year, when this painting was made, a new rail line opened from Paris to Trouville-Deauville, making travel to these resorts much easier. Beach vacationers were unconventional subjects for an artist at that time. Seascapes, if they had figures, were more typically staffed by fishermen or peasant washerwomen. Boudin's tourists, by contrast, were as modern as the black smoke rising from the arriving steamer. They had leisure time and money to spend, and were the patrons as well as the subjects of his art. 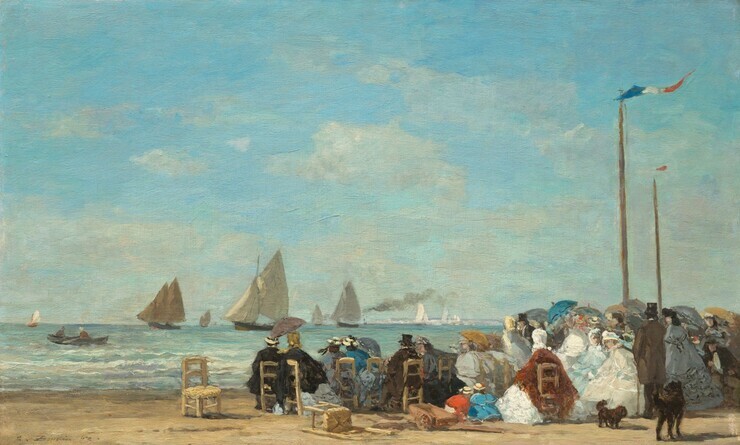 Though crowded, Boudin's beach scenes usually lack narrative or anecdote. He was characterizing a class of people, not individuals and, therefore, painted their postures and fashions, not their faces. Their very anonymity added to his pictures' modern feel. 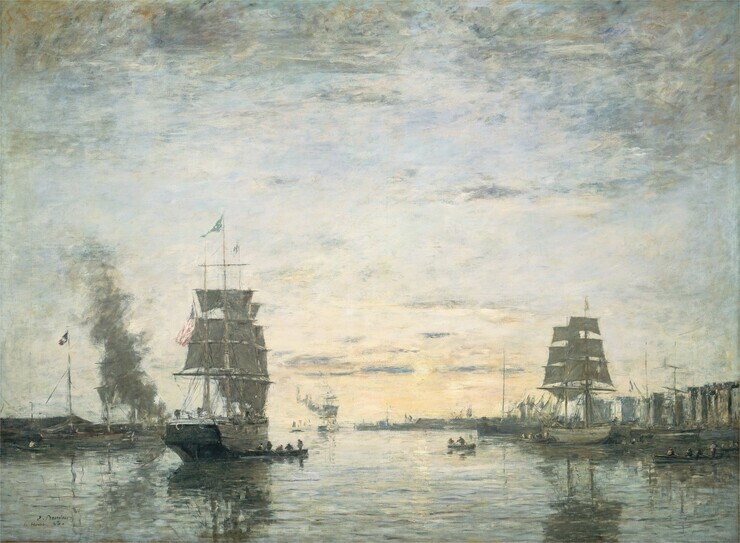 Boudin's modern subjects and, even more, the immediacy of his handling of changing light and sky were a strong influence on younger painters.